I hope all is well on your end, and that you had time last week to enjoy your Thanksgiving (assuming you celebrate said holiday), and to dig into the latest Funky16Corners Radio mix. If you haven’t yet had a chance to check out the Funky16Corners Radio Show over at Viva Radio, please do so. The last two weeks shows are archived for your listening pleasure, and there will be a new show this Thursday at 9PM. In related news, I’m working on a guest mix for the cats over at Hook and Sling, so keep your eyes and ears peeled for that one (it’s a KILLER!). Here on my end, things are still chaotic, but we have achieved a token level of stability, so onward and upward as they say. The tune I bring you today is something I unearthed many years ago in one of my favorite Philly area record holes, a place so stanky (how apropos…) with cee-gar smoke that all 45s had to be bathed and resleeved once they arrived back at the crib. Billy Davis’ ‘Stanky (Get Funky)’ is one of those records that has instant ‘label appeal’ – what self respecting crate digger would pass up a title like that?? – and as soon as you pull down the ones and zeros, I think you’ll agree that it has audio staying power as well. Oddly enough, as I mentioned before, I’ve had this 45 for years, and have hardly ever crossed paths with anyone else that knew it. So, I sit down to do a little research on this one and discover quickly that at some point it gained a certain level of popularity in the soul clubs of the UK, where my two-dollar record now seems to be changing hands for well North of the one-hundred-clam mark. Anyway…’Stanky (Get Funky)’ is a slamming but of funky soul, with a bluesy edge. I’ve never been able to track down any solid information on Billy Davis, other than I’m pretty sure he’s not the Billy Davis who was a groundbreaking A&R man at Chess records in the 60s. Though I can’t be sure (I tried to check) I think that the man who laid down this little bit of soulful dynamite is in fact the man at the other end of this link. If I find out for sure, I’ll let you know. The record itself is one of those sure-fire floor fillers (probably why the UK soulies love it so) with a rock solid bass/drums combo that sounds absolutely beautiful pouring out of a big, loud sound system. The sentimental tale of the love of a man for his gee-tar, the tune was cowritten by Davis and Burnetta ‘Bunny’ Jones. Jones, show got her start as a NY area hairdressing entrepreneur, went on to be a pioneer in the recording industry, eventually becoming the first woman to own and operate a 24 track recording studio. She was also a songwriter, with the gay anthem ‘I Was Born This Way’ among her many credits. If anyone has any details on Billy Davis, or the Davis/Jones connection, please drop me a line. Until then, get up outcha seat and groove to this one. PS If you missed either of the first two Funky16Corners Radio Shows over at Viva Internet Radio, they’re archived here, and show number three will drop this Thursday at 9PM. This is just a note to let you know that the Funky16Corners Radio Show on Viva internet radio returns tonight – Thurs 11/27 at 9PM – for its second edition. The show will play at 9PM, and will be archived thereafter at the Funky16Corners Radio Show Page (where you can still hear last weeks show if you haven’t checked it out yet). So, when you’re feeling the effects of too much turkey, get thee to the interwebs and get down with the Funky16Corners Radio Show. I hope all is well on your end, and that you all had a most excellent weekend. My world – on the other hand, is a bit chaotic and stressful right now. As a result, after the mix I’m dropping today, I’m going to take the rest of the week off. I need to relax a little and get my head screwed back on correctly. Of course, working at a newspaper, there are few weeks as stressful as the one leading up to Thanksgiving (my favorite holiday), so maybe this isn’t the best time to try and chill, but my addled brain can only concentrate on so much at any given time. Right now, in addition to the normal work stress, yet another major layoff is looming, and I have lots to concentrate on in my non-work life. This mix ought to keep you busy, and if that’s not enough, you can always dip back into the podcast archive and whip a little soul on the gang while you’re stuffing your face with turkey, taters and pie. In the history of the Funky16Corners Radio Podcast (this being the 61st edition thereof), I’ve only done a couple of ‘single-artist’ mixes (Lee Dorsey, James Brown, Eddie Bo, Jerry-O, Soulful Strings). The reason for this, is that this has always been that very few of the artists we cover in this space have ever generated enough material for a mix of their own, and those that have, probably already have compilations on the market. The ethos here being – after all – that what you dig here ought to get you out and digging for more of the same on your own. However – big however here – as in the case of the Soulful Strings – sometimes I have an artist that I dig a lot, and there is almost nothing available in reissue. The mix I bring you today is another example of someone like that. I remember the very first time I pulled a Lou Courtney 45 out of a box and put the needle to the wax. I was out digging with a buddy at a once great spot out in the hinterlands, and I happened upon a grip of 45s on the Riverside label by an artist that I’d never heard of before. Despite the fact that I knew Riverside as a jazz label, a quick look at the titles suggested to me that these were soul 45s. As soon as I sat down to preview the records on the store turntable, my suspicions were confirmed. That first one I played was the mighty ‘I’ve Got Just the Thing’ by Lou Courtney. That was probably close to 10 years ago, and that record remains a big fave. It was the beginning of a long search for more of his records, and as you’ll hear in this edition of Funky16Corners Radio, that search was consistently rewarding. Though I’ve been digging up his records for close to a decade, I’ve never been able to turn up much information on the man. Suitably enough, the little I have found is confirmation that over the years, Lou Courtney let his music do the talking. Courtney was born Louis Pegues in Buffalo, NY in 1944, and appears to have laid down his first 45 for Imperial in 1963. He recorded fairly steadily, for a variety of companies for the next 15 years. During that time, while he wrote and recorded some absolutely spellbinding soul and funk 45s, he was also writing for, and producing other artists. The really interesting thing is, that at least in the beginning, he was having as much success as a pop/rock writer as he was as a soul singer. During the British Invasion years, he and his writing partner Dennis Lambert* wrote songs that were recorded by Freddie & the Dreamers, Leslie Gore and the Nashville Teens among others. On the soul side of things, Courtney went on (often with Robert Bateman) to write for Mary Wells, Lorraine Ellison, Gloria Gaynor, Dee Dee Warwick, the Webs** and Henry Lumpkin. Though he clearly spent a lot of time working for other artists, he was (at least in my opinion) saving his best material for himself. Though Courtney’s Imperial and Philips 45s are rousing soul sides, by the time he hooked up with Riverside (and its Popside subsidiary) he had crafted a dynamic sound. Courtney had a wonderful voice with a flexible range, as adept with hard edged soul as with a gentle ballad. That he was also a talented songwriter makes his relative obscurity all the more hard to understand. I’ve gone on in this space before about ‘journeyman’ performers, who managed to record and perform through the classic soul era without ever breaking through to a larger success. Unlike many of those artists, Lou Courtney had more than enough talent to be a much bigger star, yet for any number of reasons was unable to get to that level. Much like another favorite of mine – Chuck Edwards – Lou Courtney had a knack for mixing pop and rock sounds into his soul. As a result his records have both pop hooks and a heavy edge, forceful enough for the dancefloor but with enough pop savvy to keep the dancers singing along. Between 1966 and 1968, Courtney recorded an LP (‘Skate Now and Shingaling’, both rare and excellent) and a number of 45s (some of them with amazing non-LP tracks) for Riverside/Popside. Many of the cuts from this era have become prized by both soul and funk DJs. During this period he created storming Northern style cuts like the brilliant ‘Me & You Doing the Boogaloo’ (try not dancing when you hear this one), pop-edged soul like ‘If the Shoe Fits’ and Motown influenced fare like ‘It’s Love Now’. His Riverside/Popside discography demonstrates that Courtney was an important transitional artist, bridging the gap between soul and funk. There’s not better example of this than the crate digger’s fave ‘Hey Joyce’ (its famous break sampled by DJ Shadow and Cut Chemist) It’s important to keep in mind that Courtney was working in a variety of styles during this period, continuing to record mainstream soul and ballads as well as funk. He moved on to the Verve label by 1968 (for two singles), where he continued to craft danceable soul (like the dance craze ‘Do the Horse’), ballads ( a cover of the Bacharach tune ‘Please Stay’) and edgy funk like ‘Rubber Neckin’ Chick Check’n’. He laid down one single for Buddah in 1969, the smoking ‘Tryin’ To Find My Woman’. Here (again) Courtney works both prominent guitar and combo organ into the mix, along with blazing, soulful horns. Sometime in the next few years (1971, I think) he recorded one of the most slamming funk 45s I’ve ever heard, the manic (borderline insane) ‘Hot Butter’n’All’. This is one of those records that’s so powerful it just about makes may hair stand on end. 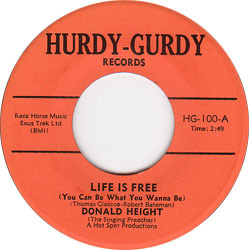 The track was also used by Donald Height (also on the Hurdy Gurdy label) for the song ‘Life Is Free’***. As far as I can tell, Courtney didn’t record again until 1973 when he went into the studio with Jerry Ragavoy to record for the latter’s Rags label. The funky ‘Beware’ was written by Courtney, produced by Courtney and Ragavoy and arranged by Leon Pendarvis. The following year Courtney would record the album ‘I’m In Need of Love’ for the Epic label. The lone ballad in this mix, ‘The Best That a Man Can Do For His Woman’ comes from that album, once again co-produced by Courtney and Ragavoy, and arranged by Pendarvis. Lou Courtney would record one more LP, ‘Buffalo Smoke’ in 1976. By this time he was working on the funkier side of disco. My favorite cut from the LP ‘Don’t Stop the Box’ is a great example of the kind of polished, funky grooves that Steely Dan was clearly listening to at the time (dig the electric piano on this one). Buffalo Smoke would go on to have a disco hit in 1978 with a cover of Marvin Gaye’s ‘Stubborn Kind of Fellow’. It was during that year that Lou Courtney would join a later version of the Fifth Dimension, during the period when Marilyn McCoo and Billy Davis Jr. were out having hits on their own. I haven’t been able to track down anything on him after that point, other than a few mid-70s sessions as a backing vocalist on other people’s albums (Bonnie Raitt, Michael Boothman). The trail goes cold. Though ‘I’m In Need of Love’, (highly regarded by modern soul fans) has been reissued, and several early tracks have appeared on compilations over the years, most of his finest work is available only to those willing to head out into the field and dig for vinyl. This is nothing less than a crime. Certainly there are countless soulies and crate diggers out there (myself included) who cherish his records, but Courtney’s was no ordinary talent, and is deserving of commemoration. I can offer up this mix, but I suspect that it’s so much ‘preaching to the choir’. Someone out there (Numero, Sundazed) ought to get to work on something (maybe a disc of his own recordings and a disc of his work with other artists?). I hope you all dig the sounds, and if you’re still out there Lou, know that your music is still loved. + I wanted to represent something from all of the labels Courtney recorded for, but have as yet been unable to get vinyl copies of the Philips, or Buddah sides. The versions here were digital copies I found online, so the sound quality may be a touch substandard. My apologies. The end of the week is upon us, and I figured that I ought to close things out with something a little hot. Just last week a commenter specifically requested “some more those obscuro greasy funky kickin’ Hammond 45’s”, and never one to neglect the wants and needs of my audience, I bring you just such a record today. Though I’ve known the name ‘A.B. Skhy’ for years, I had no idea what the group sounded like, nor – once I was deep in the crates – that their organist was none other than Howard Wales. Wales, who played keyboards on the first ‘A.B. Skhy’ LP, also recorded with the Grateful Dead (he’s on ‘American Beauty’) and Jerry Garcia (‘Hooteroll’) , as well as cranking out the rare Hammond killer ‘Huxley’s Howl’ (yes, I’m still looking for a copy…). Prior to A.B. Skhy he played on the road with the likes of Ronnie Hawkins and the Coasters, and in the studio with Freddie King and Lonnie Mack. I was first turned on to ‘Camel Back’ – as has happened many times before, and will continue to happen – via the sales list of my man Haim*. I listened to a sample and decided that whatever the cost I needed to give this particular 45 a home in my DJ box (I dropped it at the AP 45 Sessions back in March). The very cool thing about this 45, aside from the obvious funkyness, and the Hammond and the drums, is the fact that when you buy this one, you get the 45 edit on one side and the full five minute plus LP edit (which I bring you today) on the flip. That’s what I call service. Things get off to a slamming start, with the blazing horns, and Wales working it out on the clavinet, until about a minute and a half into the song, where the horn section drops out, Wales switches to the Hammond and the band gets into a very tight groove. Oddly enough, ‘Camel Back’ actually charted (just barely) in 1969, though giving the first section of the tune a good listen, it’s not too far removed from the Blood Sweat & Tears/Chicago Transit Authority vibe that was so popular at the time. As always, I hope you dig it, and I’ll be back on Monday with some more sounds. PS If you missed the very first Funky16Corners Radio Show over at Viva Internet Radio, it’s archived here. *Haim is an old friend, who also happens to be a serious record collector and dealer who has turned me on to COUNTLESS fantastic records over the years. Do a Google search for “funky16corners+haim” and see how many times I’ve mentioned him over the years. His crates, and knowledge are deep. Just a reminder that tonight (Thursday) at 9:00PM I’ll be trying something new, with an on-line show at Viva Internet Radio. It’ll be a weekly thing, with new episodes every Thursday, and lots of the kind of stuff you’re familiar with the ye olde blogge, except with the added “benefit” of spoken commentary from yours truly. The shows will be archived after each premiere, so if you aren’t around when it drops, you can fall by the Viva site and give it a listen (I really dig their player/interface too). I’ll be back tonight after the show with a new post for the weekend. I come to you in mid week with a very tasty, very gritty and altogether typical slice of mid-60s Detroit soul. Those that know me will tell you that I have big ears, literally as well as figuratively. I’m open to all kinds of sounds and I am always listening, whether to movie soundtracks, the radio, TV, the interwebs and most especially when I go to hear a DJ with deep and flavorful crates. The tune I bring you today flew past my ears and into my fevered brain one night when I was out scounting the web looking for audio samples from which to extract drops for one of the Funky16Corners Radio mixes. I was bouncing around YouTube, and I happened to plug in the term ‘northern soul’. After picking my way through countless videos of rare 45s spinning on turntables, I found a short piece about Northern Soul. It was during this piece that I heard a very cool song, and if memory serves, all the data I was able to extract was the repeated phrase “Soon be gone”. I whipped out a little Google-Fu, plugged in that phrase and ‘Northern Soul’ into the old search engine and before long I deduced that what I had heard was ‘You’ll Soon Be Gone’ by the Precisions. I started searching immediately, and before long I had secured a copy, which I promptly digi-ma-tized, and then spun at the July Asbury Park 45 Sessions. Why has it taken so long to be featured here? I can’t honestly say. It’s probably a mixture of I’m waiting for the right vibe b/w I keep finding new stuff all the time and sometimes the ‘pick a song for the blog’ part of my brain resembles the big barrel of pingpong balls that they use to pick bingo numbers. Either way, once you pull down the ones and zeros you’ll agree that it was worth the wait. The Precisions were a Detoit group that recorded for D-Town, Drew and Atco in the mid-to-late 60s. Their Drew 45s are the very definition of unfuckwithable, including the impossibly rare ‘Sugar Ain’t Sweet’, ‘Such Misery’, and the flip side of this very record ‘If This is Love’. This is heavy, high quality Detroit magic, the sweet mixed with the heavy, the smooth with the raw and all built on a very solid Funk Brothers style musical foundation (it is after all produced, arranged and co-written by Mike Terry). ‘You’ll Soon Be Gone’ has a much darker sound than much of their other sides, with a vibe not too far removed from some of the later Revilot sides by the Parliaments. I especially dig the slightly fuzzed out guitar that bridges the end of the chorus and the beginning of the verses. It’s a very heavy record, and I hope you all dig it. In related news, this Thursday at 9:00PM I’ll be trying something new, with an on-line show at Viva Internet Radio. It’ll be a weekly thing, with new episodes every Thursday, and lots of the kind of stuff you’re familiar with the ye olde blogge, except with the added “benefit” of spoken commentary from yours truly. The shows will be archived after each premiere, so if you aren’t around when it drops, you can fall by the Viva site and give it a listen (I really dig their player/interface too). Here’s hoping the beginning of another new week finds you all well. The tune I bring you today, while not a ‘Hammond Groove’, actually contains Hammond organ, and is quite groovy, so we might just be better of considering that particular hair split, and move on. Brian Auger and Julie Driscoll (and of course the Trinity, and Oblivion Express) have made several appearances at Funky16Corners, more often than not with instrumentals, but with the occasional vocal (like today for instance). There was a thread over on Soulstrut a while back considering the new wave of white, female ‘soul’ singers from the UK (some way more soulful than others), and several posters (myself included, natch) made a point to reference the fact that this was in no way a new trend, namechecking the likes of Kiki Dee, Lulu, Dusty Springfield, and of course, Julie Driscoll. While Driscoll was no Aretha Franklin, there was definitely a helping of soul in her vocals, mixed in of course with a healthy dose of 1967/68 hippy freak out. This, along with Auger’s organ-ization created some very groovy music. The tune I bring you today is a cover of the Otis/Carla version of Lowell Fulsom’s ‘Tramp’ sees Brian and Jools taking things at a slightly more relaxed pace – though not too relaxed, on account of that wouldn’t be cool, would it now?? – and you definitely get a real bit of London discoteque-au-go-go flavour (sic). I dig the pumping Hammond, and whoever’s laying down the bass was mos def in the pocket. I hope you dig it (you know I do). Today’s selection is something of a Funky16Corners/Iron Leg collabo-thingy, in that part of today’s IL post is an earlier, stylistically different 45 by Woody Carr (as well as another 45 tangentially related to that one). You should head on over there and check it out when you get a sec. That out of the way, the tune I bring you today – in this space – is a very groovy, very moody and somewhat funky side from 1968, entitled ‘Peace Dance’. Woody Carr is a longtime Pacific Northwest singer, who recorded with his band the Entertainers and as a solo in the mid-to-late 60s for the Jerden and Picadilly labels. Though the 45 with the Entertainers is pretty conventional 1966 rock/pop, ‘Peace Dance’ (from 1968) is something else entirely. First off, how some enterprising soul hasn’t gotten their hands on this 45, and chopped and looped it into something with the hip to the hop to the wikki wikki, I do not know. All I know is that the drum and bass breakdown in this tune is shweeet (not to mention the ill horn stabs) , and then Woody comes in with the soulful vocals, and THEN, about halfway through the song he takes a minute to drop a little topical 1968-osity into the mix – with the Abraham Lincoln “sample” and all of a sudden the whole deal gets a little far out. The cool thing, is that this is record that the crate diggeur-ati would refer to as “slept on”, which means not a whole lot of people know about it, and as a happy result it should be gettable at a reasonable price (which of course you ought to do post haste, so that it might be whipped on the crowd at your next potato chip and ripple party). Stay well and I’ll be back on Monday. I wasn’t expecting to do a midweek post*, but I heard the news of yet another important passing (no less that the ninth reported here in the last few months), and could not let it go by without taking note. The group of musical émigrés that came to the US from South Africa in the 1960s, including Hugh Masekela, Letta Mbulu, Caiphus Semanya, and Jonas Gwangwa has always held a fascination for me. They all made some mark on the musical scene of the 60s, some to great financial success (Masekela’s 1968 hit recording of the Philemon Hou song ‘Grazing In the Grass’). One of the most prominent members of that group, Miriam Makeba died this week at the age of 76. Her biggest hit, 1967s ‘Pata Pata’ (covered countless times***) is also a personal favorite of mine. It is a singularly joyful record with an infectious rhythm and a lyric, which – although written (I think) in Makeba’s native Xhosa – draws the listener in and compels you to sing along (or at least try). While I was tearing through my record boxes tonight trying to find this single – an infuriating task since I’d had it in my hands, and my dj box several times in the last few months – I was shocked to notice for the first time that the tune was co-written by none other than the great Jerry Ragavoy! That said, pull down the ones and zeros and let the spirit of the music take you over, and remember the great Miriam Makeba. Check out this great clip of Makeba performing ‘Pata Pata’ on Brazilian TV, with none other than Sivuca on guitar! I hope all is well on your end and you found the weekend to be both restorative and fun-filled (not always the same thing, y’know). I figured I get the week started with something lively, raw and soulful. The tune I bring you today is one of the last 45s recorded by Mr. Henry Lumpkin. Lumpkin was one of the early lights of Motown, recording two 45s for the label in 1962. One of those 45s happened to be the original version of the R&B/soul standard ‘Mojo Hannah’ later covered by Larry Williams, Betty Harris and Tammi Lynn among others. Lumpkin’s time at Motown was over almost as soon as it got started, but it was there that he made an important connection, that being songwriter and producer Robert Bateman. Five years after his stint with Motown he hooked up again with Bateman, and the man who was by then Bateman’s partner – and a big favorite here at Castle Funky16Corners – Mr. Lou “Hot Butter’n’All” Courtney. It was with Bateman and Courtney (as co-composers and producers) that Lumpkin made what is perhaps the greatest record of his career, 1967s ‘Soul Is Takin’ Over’. If you’ve been sitting around, wasting away, wondering when your next dose of soul clapping was going to arrive, I’m here to let you know that Dr. Soul is about to fall by with your prescription. ‘Soul is Takin’ Over’ is a dance-floor pounder from the git go, with the aforementioned soul clapping, throbbing bass, guitar, piano and drums, all dragged around the studio by Lumpkin’s razor sharp delivery of the anthemic chorus. If ever a soul 45 was seeming engineered specifically for use as a drunken sing/dance-along, ‘Soul Is Takin’ Over’ is it. Unfortunately, no matter how good the record is – and it is, good that is – it’s yet another example of a fantastic 45 that got lost in the shuffle, ultimately doing nothing to advance its singer’s career. Lumpkin would make one more 45 for Buddah, and the promptly fell off the face of the earth. Make sure you pull down the ones and zeros, and the next time you have the gang over for a rug-cutting session, get’em lit and throw this one on, open the windows and piss off your neighbors.